Contains carnitine and alpha-lipoic acid in their most effective forms. Mitochondrial Formula is an exceptional formulation combining three essential anti-aging compounds: pyrroloquinoline quinone (PQQ), R alpha-lipoic acid and acetyl-L-carnitine. It is one of the best products on the market along with Astragaloside IV 98% and Nicotinamide Mononucleotide 98%. Who is Mitochondrial Formula aimed at? Mitochondrial Formula is for anyone over 50 who wants to age well. It has been formulated to optimise existing mitochondrial function and facilitate the biogenesis of new mitochondria. What is in Mitochondrial Formula? Mitochondrial Formula contains three exceptional compounds that benefit the antioxidant system and mitochondrial function. Pyrroloquinoline quinone (PQQ) (10mg per capsule). Alpha-lipoic acid (the R form). Its versatility: it attacks oxidants in both aqueous and lipid environments, unlike vitamin E (lipid only) and vitamin C (aqueous only). Its regenerative power: it is able to recycle ‘used’ antioxidants that have been neutralised by oxidative elements, and so increases the life and efficacy of vitamins E and C and glutathione (it also promotes production of the latter). Its chelating effect: it can trap heavy metals such as arsenic, cadmium and mercury. Its ability to repair: in certain cases, it is able to repair oxidative damage to molecules, particularly proteins. Carnitine is an amino acid used by the body to convert fats into energy (in the form of ATP). The body produces it from lysine and methionine, two simpler amino acids found abundantly in food. But this process, which also requires vitamin C, several enzymes, iron, vitamin B6 and vitamin B3, appears to ‘peter out’ as we get older. It’s not known whether these are the kind of frequently-observed declines that are related to age or whether it’s the aging process itself which upsets the production mechanism, but the fact is that energy-demanding cells such as those of the heart muscles and brain, end up short of ‘fuel’. Why is it important to take care of our mitochondria? Mitochondria are the little powerhouses found in each of our cells which convert the energy in our food into a form that can be used by the body (‘ATP’). Over time, these powerhouses become compromised because this energy conversion involves the unwelcome production of toxic molecules called reactive oxygen species (ROS). While these unstable molecules attack the body as a whole, they have a preference for compounds close to their site of production. Mitochondria are therefore particularly affected by oxidative attack throughout life. The body fights off these attacks by producing antioxidants, which, rather like a ‘flak-jacket’, take the brunt of these attacks in the place of molecules that are important to the body order for it to function properly. It also uses exogenous antioxidants obtained from the diet or produced by the bacteria with which it collaborates. PQQ is one of these exogenous antioxidants. It’s found in tiny amounts in plant-source foods, primarily green vegetables (7). Over time, the damage from these attacks degrades the systems responsible for producing endogenous antioxidants, which rapidly increases the extent of the damage and speeds up overall decline. It is precisely to delay this latter stage that antioxidant supplements have been developed such as lipoic acid and PQQ. 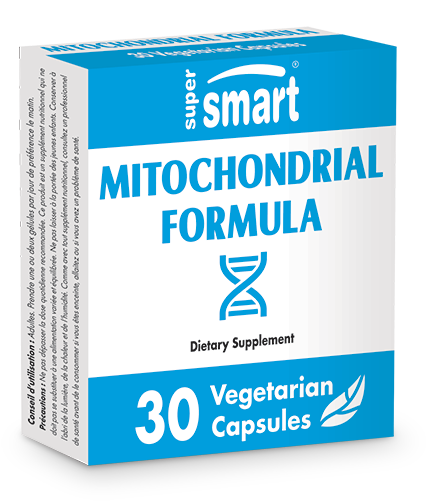 This offers the additional benefit of supporting the growth of new mitochondria (8-9). As these powerhouses ensure the conversion of energy essential for life, mitochondrial dysfunction quickly leads to accelerated aging and a deterioration in health. When should Mitochondrial Formula be taken? PQQ and carnitine are absorbed most effectively when taken with fat-containing food (as they’re fat-soluble). R alpha-lipoic acid has a relatively short life in the body so it’s better to take two capsules at different times of the day. It’s therefore advisable to take one capsule in the morning with breakfast (ensuring it contains some fat), and potentially a second capsule with lunch. In clinical studies, scientists used doses of 10mcg-20mcg of PQQ a day. In studies demonstrating benefits from supplementation with alpha-lipoic acid and PQQ, several weeks’ treatment was required before these effects were seen. It contains the R form of alpha-lipoic acid, the form produced by the body. Alpha-lipoic acid supplements are always produced in a laboratory. The process results in a mix of two forms: the R and S forms. The R form is exactly the same molecule as that produced by our bodies, while the S form is merely a poor copy and appears to be completely inactive once absorbed. Most of the supplements on the market contain both forms as separating them is quite a costly process. Mitochondrial Formula contains just the R form, avoiding the need to ingest the non-natural and inactive S form. The form of carnitine included is fat-soluble, which means it acts more specifically in the brain (10-15). The majority of carnitine supplements contain water-soluble forms. Older people’s cells contain far fewer mitochondria than those of young people, and function slowly. This leads to a significant fall in energy production. This is a factor in almost all age-related degenerative diseases. Mitochondria have their own DNA which unlike the DNA in the cell nucleus, does not have effective repair systems. They are therefore much more vulnerable to self-generated ROS. Can other supplements be taken alongside Mitochondrial Formula? the exceptional Anti-Aging Pack de référence pour retarder le vieillissement et for slowing down the aging process and and its even more powerful sister version. Carnitine is not recommended for anyone with hypothyroidism as it has a mild effect on the action of the thyroid hormone (16). As alpha-lipoic acid is very sensitive to heat, humidity and light, Mitochondrial Formula must be kept in a cool, dry place, away from light.